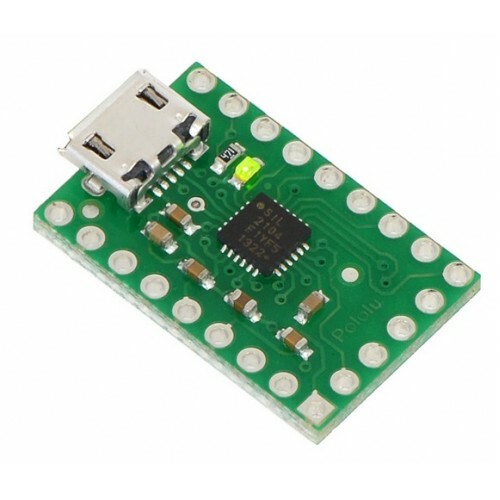 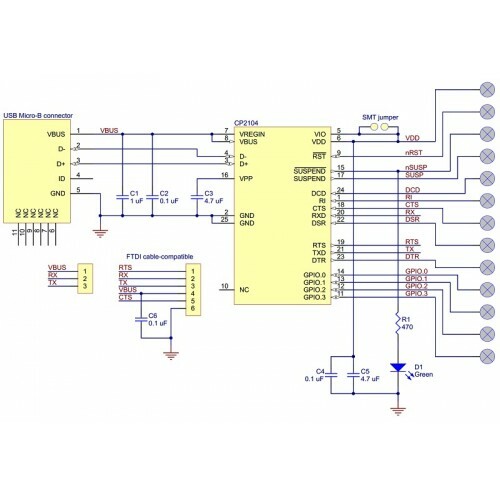 The board is a great solution for connecting microcontroller projects and other logic-level serial devices to a personal computer. The tiny unit measures only 0.6″ × 0.95″ including its Micro-USB connector. 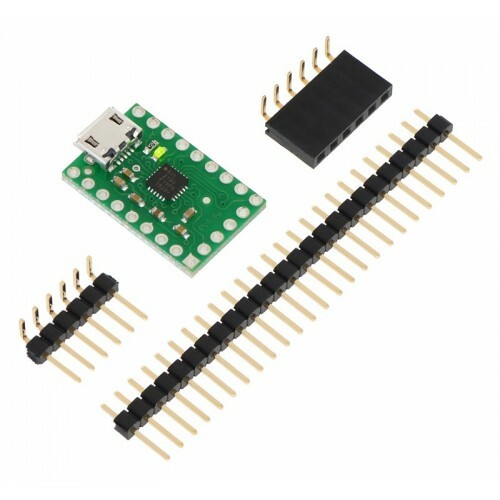 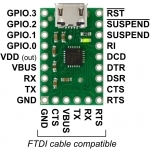 It offers several options for accessing the data, control, and GPIO pins on the CP2104, all of which are made available on a 0.1″ spacing. 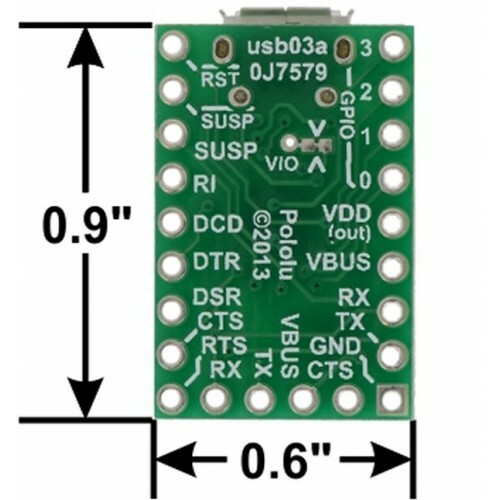 This board uses 3.45 V signal levels by default, but the signal pins can tolerate higher voltages, allowing the adapter to be used with 5 V systems that see 3.45 V as a logic high. 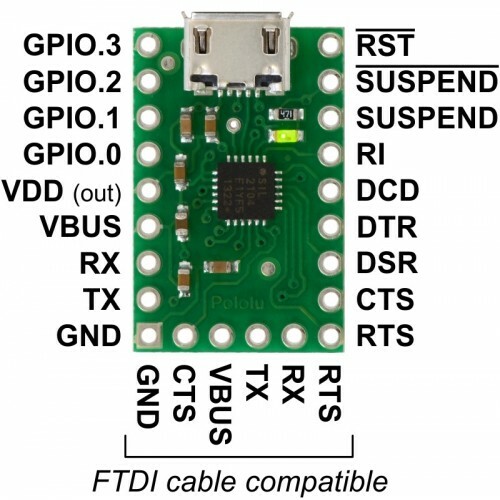 The green LED on the SUSPEND line indicates an active USB connection when lit. 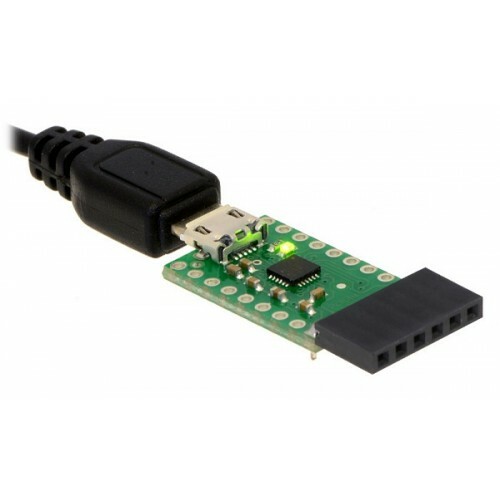 The adapter looks like a standard virtual serial port (COM port) to the computer’s operating system, which means it can be used with any software designed to work with a serial port (even a legacy RS-232 port). 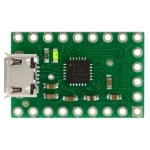 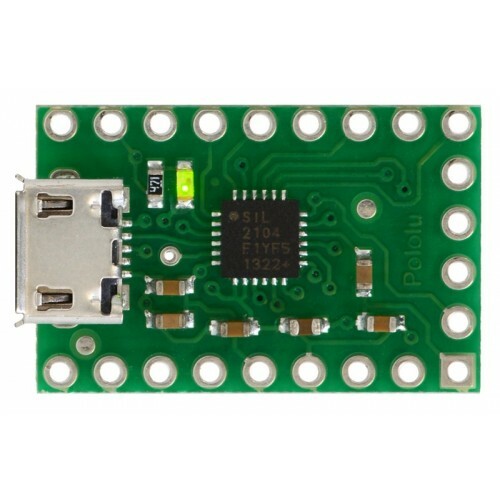 The CP2104 is a full-speed USB 2.0 device and allows baud rates of up to 2 Mbps. Drivers are available from Silicon Labs for Windows XP, Windows Vista, Windows 7, Windows 8, Linux, and Mac OS X. 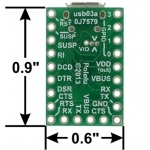 This carrier board connects the VIO pin of the CP2104 to VDD by default, setting its logic voltage level to the 3.45 V provided by the IC’s built-in voltage regulator. 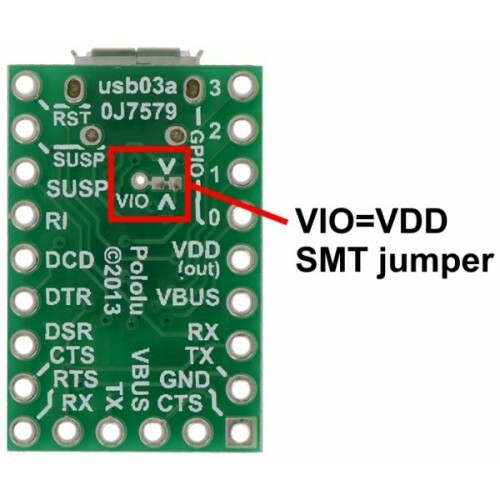 If you want to use a lower logic voltage, you can disconnect VIO from VDD by cutting the thin trace between the two pads of the surface-mount jumper shown to the right. 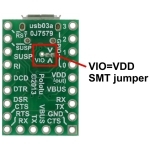 You can then solder a thin wire to the exposed via labeled “VIO” and connect it to a separate voltage supply (as low as 1.8 V).